This changes the default "Combat Leg Armor" model from just a big plate on your thigh and instead gives you shin/knee protection. 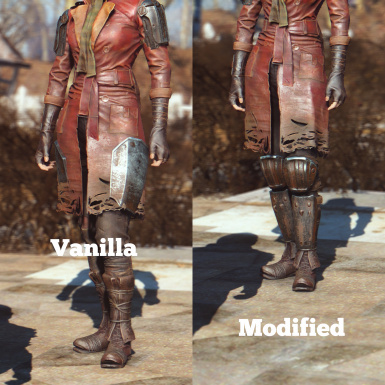 This is a simple mod that changes the default Combat Leg armor for both male and female characters. Now, instead of a single thigh plate for both your legs, you get some shin/knee protection instead. The model used is from the Sturdy/Heavy Combat Leg armor, only you won't get the big thigh plate. 2) Piper is my fav companion right now, and I really dig her coat - but don't like seeing big thigh plates clipping through. 3) Like the leather/metal/raider armors, the default combat leg armor starts at the shin, then goes up to the knee. And with the upgrade to sturdy/heavy, you get the addition of thigh protection. Found it strange that the Combat Armor didn't follow the same route. And that's why I made this ! Use Nexus Mod Manager ! 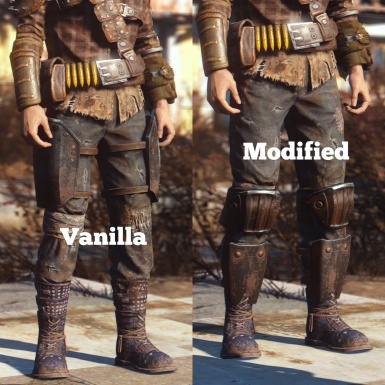 There is a version of this mod available for use with Endormoon's Custom Combat Armor (http://www.nexusmods.com/fallout4/mods/4865/? ), and the appropriate files are located on his mod page. 4k Combat Armor Retexture by Leyr - http://www.nexusmods.com/fallout4/mods/7381/?